Bouie had the best all around day of the group. Controlled the boards, handled the ball well, finished in traffic and knocked down shots. Last year at the Dynasty Drills and Rangeman Films #RUREEL event Tyrell showed off his improved jump shot. Saturday he continued to show improvement, hitting a variety of outside shots. If the upward development curve continues over the next 3 years, Bouie should find himself on the radar of some college coaches. Pat burst onto the scene just a few short weeks ago at the #PBCHOOPS c/o 2022 "Welcome to the Show" event. That performance earned him an invite to "Showtime" where he picked up right where he left off at "The Show", blocking shots, rebounding his area, bringing energy, slashing and finishing at the basket. All this without a consistent outside game, which should be the next focus area of development. We are excited to monitor Pat and his continued development over these next four years. Jonathan Joseph has a polished game and put it all on display on Saturday. Long and lanky, Jonathan gets up the court at a nice pace, always under control with a very solid handle. A high basketball IQ player, JJ is looking to make the right play, either pass, screen, rebound or score. While he is not a shoot first guard he has no problem scoring the basketball when his team needs him. Saturday with his team down big, Joseph scored 14 straight points on a variety of contested perimeter shots from behind the arc, midrange and off the dribble. The next major step will be for Joseph to get stronger and to continue to work on the key points of his game. High basketball IQ guard, showed the ability to knock down outside shots. Was able to break down defenses off the dribble and attack the rim. On defense, aggressively rebounds the boards and blocks shots. The next stage of development will be continued focus on skill set, which will further progress his game. Showed he is a capable point guard, led his team well, made the right pass and directed the offense. Very aggressive on defense, Frederick came into the event with a point to prove and played very well. Continued focus on ball handling and more consistent shooting will make him a prospect to watch. Ultra quick guard with the ball in his hands, always in attack mode putting pressure on opposing defenses. The lefty has a craftiness to his game that allows him to create space to drive or open up passing lanes. An area of improvement Maxwell will need to focus on is shooting, we would like to see some work done in this area which will make him even harder to guard. Allen is a high energy player with nice size at the guard position. A slasher with the ball in his hands, he uses his athleticism nicely to make plays. Showed the ability to make open looks and used the midrange effectively. Further focus on ball handling is something we would like to see as he progresses. Cowan showed his blue collar work ethic from the jump, making plays going after loose balls, getting into passing lanes and being an overall pest on the defensive side. Usually the scrappy types are reserved for small guards but at 6' 3" and a strong frame Vedan used his motor to create for his team. As his outside shot develops we can expect to see more production on the offensive end. Sees the court very well which enhances his passing skills. Undersized PG but keeps defenders off balance with his shooting. Tends to over dribble which can stall the offense, we would like to see quicker decisions to get into the offense. Great 6' 3" frame, very lean with broad shoulders. Really stood out during skills sessions. During game play took a game or so to get into his comfort zone. Size, frame and overall skill will make him a player to keep an eye on. Continued his impressive play from #TheShow, solid shooter, defender, a good lead guard. Will get minutes on Olympic Heights varsity this year. Struggled to find his way early in game play, picked it up in the last 2 games. High IQ point guard that made the right play on offense, coach on the floor. Had the outside shot going, knocked down several shots. Willing defender but had trouble stopping bigger, longer point guards from getting shots off. Use of mid-range jump shot is an area we most would like to see improvement. More comfortable when the game is in transition, high energy. Outside shot wasn't falling, needs to become an automatic shooter to open up his game. Improved focus. Crafty player who makes the right play, has a nose for the ball and can shoot it. Continued ball handling skill development will open up opportunity. Will be a varsity player at South Fork as a freshman, plays with pace and gets others involved. Needs to improve conditioning to make an impact at varsity level. Improved ball handler. A slasher that can really shoot the 3 ball. Next level of improvement would be the ability to create own shot off the dribble and use of mid-range jumper. Very quick first step and explosive off the dribble. Can get off the floor quick which makes him an asset around the glass on both the offensive and defensive boards. Played too unselfish at times passing up scoring opportunities. Overall solid player. Jonathan Dor (Santaluces HS) c/o 2021 Strong but undersized, attacks the basket effectively. Will need to improve conditioning and consistency on outside shot. Bijan Hunter (The King's Academy) c/o 2021 A definite glue guy, does all the little things to give his squad an opportunity to gain extra possessions. Not afraid to mix it up. 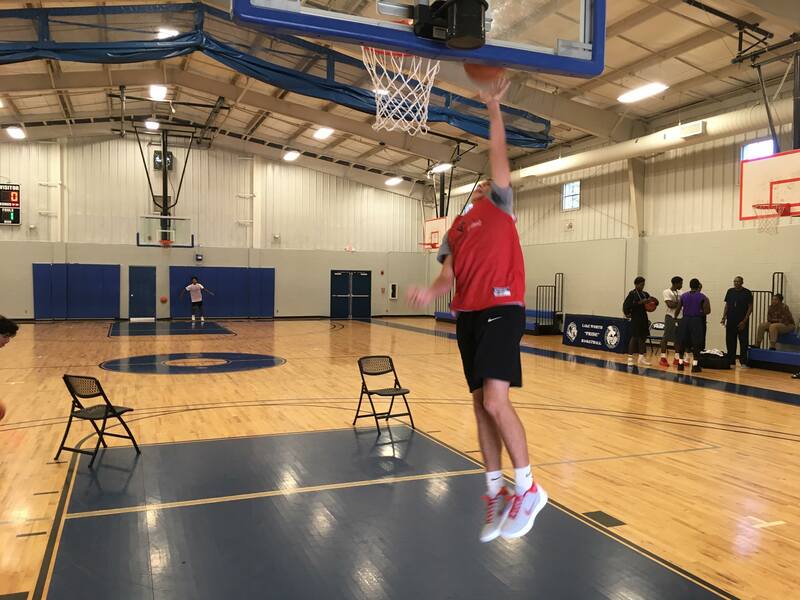 Griffin Hallenbeck (The King's Academy) c/o 2021 Tough player, blue collar type. Can get tough baskets inside. Miraldo Dastineau (Santaluces HS) c/o 2022 Very long and productive in spurts. Will need to improve overall strength and skill set. PM Session recap will be posted on our website later today.